Had a rare experience yesterday - no power! I wish I could say it was due to a torrential storm, a downed tree, or maybe an unfortunate accident. But no, it was a scheduled power outage because a power pole needs replacing in the neighborhood. They sent a nice letter of notification, but I didn't do a very good job of scheduling a project to work on that required no electricity. 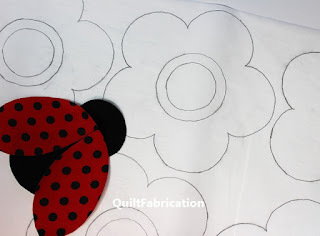 My day amounted to tracing a few flowers to go with the ladybug I had cut out the day before. 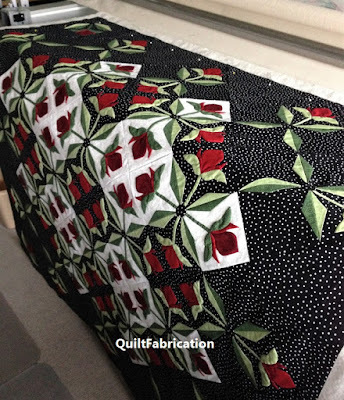 And if you're reading this far, that's a sneak peek of what I'm making for the Show Your Wings Blog Hop, hosted by Carol at Just Let Me Quilt coming up February 18 - 21. I've been designing all week, and I'm happy to finally get to the fabric stage - he looks so cute! I'll have more on this hop in a couple weeks. So, with lots of computer designing, and then no electricity, the Med Rose quilt is still in the same state on the frame. In reality, I'm stalling, cause I'm not quite sure how I want to quilt the black background. But once I figure it out and get started, I'll stick with it to get it done. Enjoy all of your quilting adventures this weekend!